Can the Waratahs survive the quarter-final after a Brumbies thrashing? Actors claim that a poor dress rehearsal is an omen for a brilliant opening night. 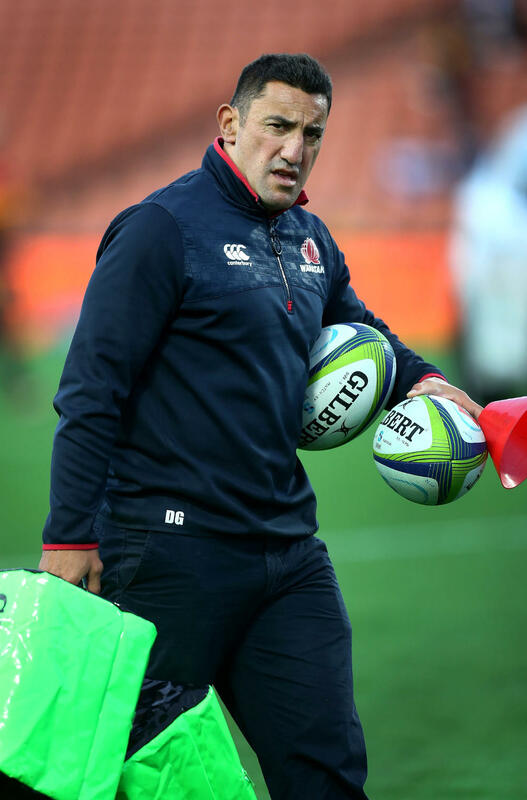 After the Waratahs dreadful 40–31 against the Brumbies, the players and the coaching staff will be hoping that some of this theatrical gold dust descends on their side for their 2018 Super Rugby quarter-final against the Highlanders at Sydney next weekend. But are we talking about gold dust or bull bust? There is something, probably, in this. The Jaguares who were in a similar situation to the Waratahs, with a guaranteed place in the finals, were comprehensively defeated by the Sharks, in the wet at Durban. This win took the Sharks into the finals, at the expense of the Rebels, and to the dubious pleasure of flying from South Africa to Christchurch to face the Crusaders, the favourites to win the Super Rugby title. There is something in the theory of dress rehearsal blues, then, but not everything. What was impressive about the Brumbies and their demolition of the Waratahs was how comprehensive it was. In all the different facets of play, except for the Waratahs short kick-offs, the Brumbies were dominant. The Brumbies exposed a weakness in the lineout by playing the Arnold twins – the tallest second row pairing, apparently, in the history of Super Rugby. 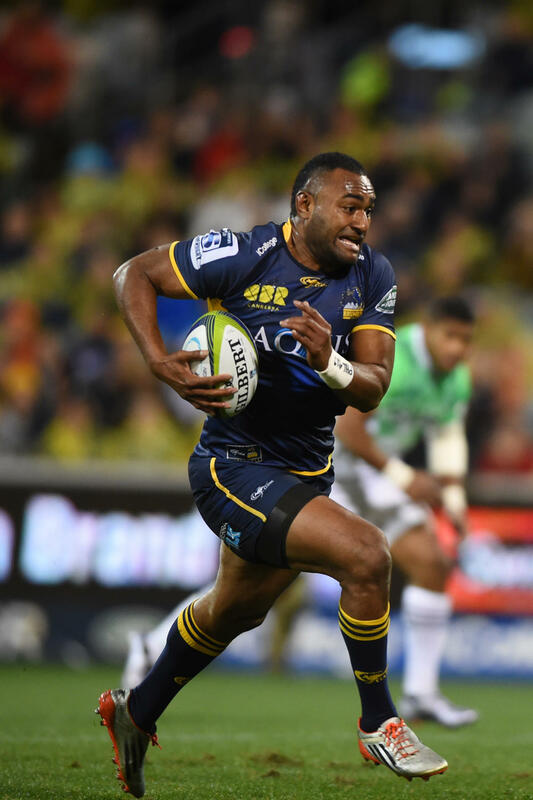 And by keeping the ball in hand and using their big runners to run at the Waratahs defence, which could not cope with the onslaught, the Brumbies gave a game-plan blue print to the Highlanders use during the Sydney quarter-final. The defence (or lack of defence) provided by Kurtley Beale was almost cruelly exposed. 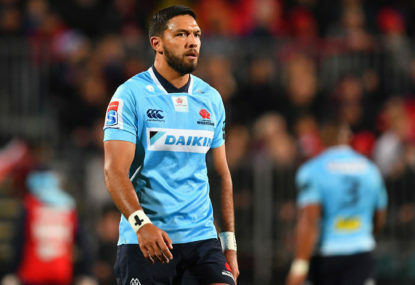 This tactic of Kyle Godwin and Tevita Kuridrani running hard at and sometimes towards the outside shoulder of the Waratahs backs proved to be the undoing of the Waratahs backline. For the first time we saw, too, how impressive Godwin can be when he is allowed to play an all-court game with the ball. With the impressive attacking and defending play Godwin exhibited, it is a pity that at age 25 he is off Ireland with time to qualify, if called on, for Ireland in the 2o23 Rugby World Cup tournament. Kuridrani, too, proved to be a revelation. He totally monstered the Waratahs defenders. He showed pace, too, in making the outside break that has been lacking in his play for several years. There was deft passing and ferocious tackling that offers Michael Cheika, the Wallabies coach, the dominant player out wide who can expand an attack and smash back an opposition onslaught. The questions I want to ask now are these. Why haven’t we seen this Kuridrani playing for the Wallabies? And why didn’t we see this Kuridrani over the years with the Stephen Larkham Brumbies until the coach left the franchise? Readers of The Roar will know that I have had concerns about the quick promotion of Larkham to the Wallabies coaching squad before he had achieved real success with the Brumbies. Part of that concern related to the way few of his Brumbies actually improved their play. Moreover, the Larkham Brumbies rarely play an all-court and ensemble game that is the basis of winning tournaments and big matches in the modern era. 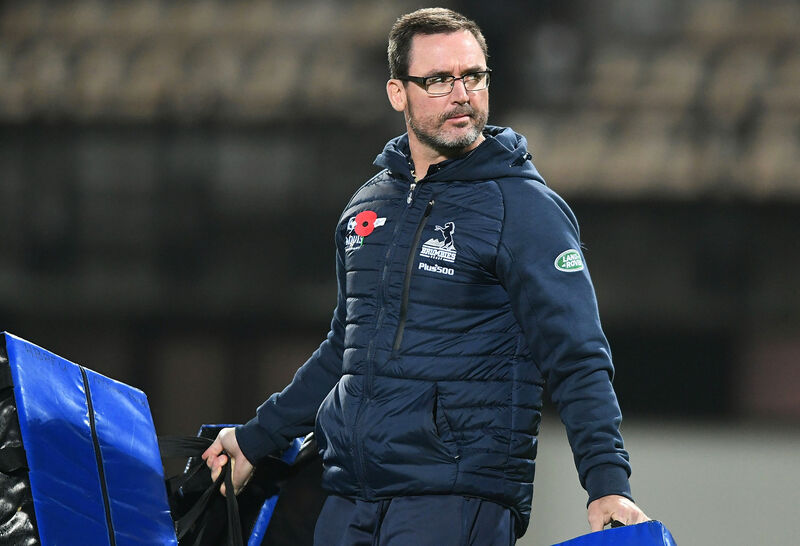 We look now at the best thing to happen to the Brumbies, in my opinion, since Jake White restored some pride and discipline into the team, albeit with a restrictive Jake-ball game plan, during his tenure as the head coach. That best thing is the appointment this year of Dan McKellar as head coach for the Brumbies, succeeding Larkham. McKellar is more the future of Australian coaching, at the Super Rugby and international level, than anyone on Cheika’s squad right now. He was a stellar prop for the famous Souths Rugby Club in Brisbane, winning a premiership in 2000. It is quite remarkable how many former front rowers have emerged as successful coaches. My theory is that an understanding of the vital importance of good set piece play by the forward is a key to coaching a winning side. There are other aspects of McKellar’s career, too, that I find interesting. He started his coaching career as a player-coach for the small rugby club he played at outside of Dublin. He has been a head coach at his old Souths club. Then, with the Tuggeranong Vikings Rugby Club in Canberra, he won two successive premierships in 2011 and 2012 in the premier grade competition. What you have in this curriculum vitae is someone who has done some real coaching, not management of a coaching staff, and had real success in the process. This last point, in my view, is important. When you look at the coaches at the highest level, almost invariably, they have coached in the amateur club competitions for some time and they have had success in this difficult arena. And when McKellar took over the Brumbies this year, he stated that he wanted to change the orientation of the franchise from an obsession with the Jakeball game to a more inclusive and dynamic ensemble game plan. It is much harder to learn this multi-skilled ensemble game and throughout this season while the Brumbies were in the learning process their ambition far out-reached their skills. But against the Brumbies everything clicked, finally, into place and the six tries to four victory over the Waratahs has, hopefully, given a preview of what the Brumbies can achieve next year. We should perhaps wait and see how the Waratahs respond to the demolition job done on them by the Brumbies when they play the Highlanders over the weekend. But I have sinking feeling that the Waratahs/Wallabies game coached by Cheika, backed up by mainly Waratahs players, may be reaching a point where it needs to be updated more towards the game plan revealed by the McKellar Brumbies. And there is another point to make here. Before the Rebels played the Highlanders, Rod Kafer made a reference to the fact that Brad Hodge was playing at No.10 but that he felt this was not his best position. It has been clear to me for some time (and I have written about this) that Hodge needs to be developed not just as the back-up for Bernard Foley but as his successor, possibly before the 2019 Rugby World Cup tournament. Hodge gave a virtuoso performance at No.10 charging down kicks (and scoring tries from the charge-downs), scoring 29 points (out of 37), passing long and short, tackling, and running. You could believe at times when this magic was being produced that the great Larkham himself had been resurrected for a final encore as a player. By defeating the Rebels, the Highlanders have given themselves their best chance of winning the 2018 Super Rugby tournament from the sixth spot. For instead of playing the Lions at Johannesburg, if the results had turned out differently, they play the wounded Waratahs at Sydney. If the Lions are defeated by the Jagueras in the South African conference quarter-final (unlikely, though) and if the Highlanders defeat the Waratahs (less unlikely), they get a home semi-final. 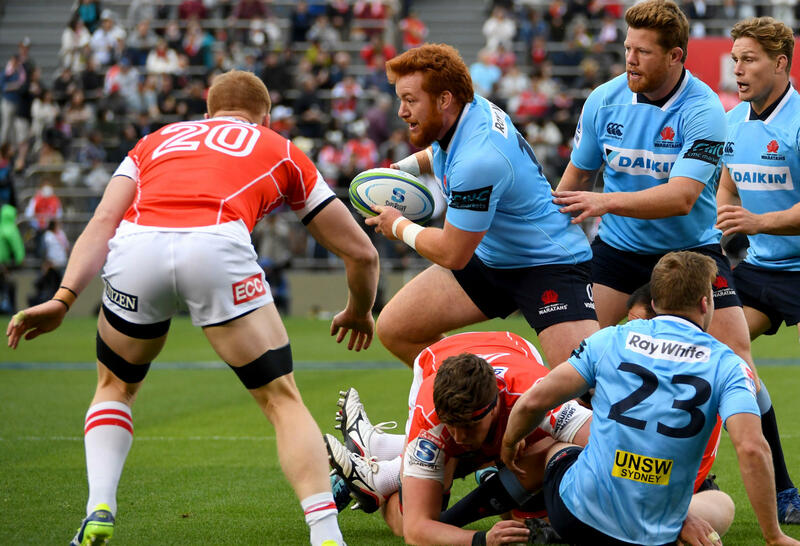 The Waratahs journey into the finals is just as problematical. If they defeat the Highlanders and if the Lions defeat the Jagueras, they have to travel to Johannesburg to play the Lions. Then, if they win, they have to travel to New Zealand to play a New Zealand side. They would get a home final in the extremely unlikely events of the successive Waratahs victories over the Highlanders, the Lions or the Jagueras, and the Sharks defeating the Crusaders and then the winner of the Hurricanes and Chiefs quarter-final. If the Waratahs players were too complacent going into their match against the Brumbies, the schedule towards the 2018 Super Rugby title that they have created for themselves looks to be far too onerous for much hope of success. You can’t help feeling that a team with its mind on the job and with a belief in their chances of winning the tournament would have been far more ruthless than the Waratahs were against the Brumbies.